Taylor Lautner and his new movie Abduction. For a while there they were throwing everything at that kid. Multiple offers, multiple millions, a lot of hype without much to back it up. Lautner has Twilight, sure, but Twilight is what makes Twilight. Lautner doesn’t make Twilight. 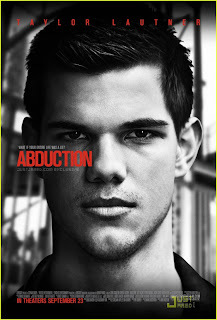 Abduction is his first opportunity to prove he can carry his own sh-t. He needs this. Which, I mean, that is so sad to me. That a 19 year old “needs” his movie to open strong. But this is what they’ve made him. This has always been my problem with Lautner. It’s that trained earnestness. Being earnest authentically is a fine quality in a human being. It’s a very, very weird quality in a packaged automatic Hollywood money machine who doesn’t actually know what real feelings feel like. Having said that, I am not 12. Taylor Lautner’s problem going forward though is whether or not he’ll ever be able to move beyond appealing to a 12 year old. Justin Bieber looks to have a better chance of this than he does right now.